You do well for your money here. 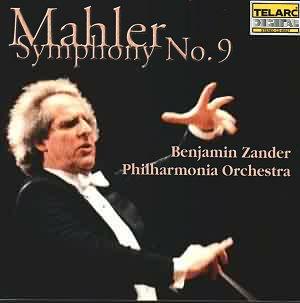 For the cost of one full-priced CD, in addition to the two containing the "live" performance of the symphony there's a third containing a seventy-six minute illustrated talk by Zander entitled "Conducting and Listening to Mahler's Ninth Symphony". Along with a liner essay by him there's also a single sheet containing a reproduction of the first two pages of the score (complete with the conductor's notations so you can follow the major part of his talk on how to conduct the piece), a plan of the orchestra layout, two "beat charts", some engravings of Mahler conducting and a note from a little girl thanking Zander for his performances. Everything but a stethoscope so you can listen to see if you have an arrhythmia to match the composer's (rendered in music in the first bars of the work) and an appointment with a Freudian analyst to see if your mental state matches Mahler's. Here I jest. But it does raise the question as to how much the listener needs by way of "support" before listening to Mahler's Ninth and why this recording might be so special that it needs them. Is it not the case that listeners have managed without such things and could in the future ? Benjamin Zander is a teacher and, judging by all that comes with this set, a good one. His work with the pro, semi-pro and amateur Boston Philharmonic gives shining evidence of his virtues in this role too. He is also in demand the world over as one of that current "flavour-of-the-month" gurus: the Inspirational Speaker, called in by organisations to put lead into the emotional pencils of employees and, in his case, never failing to use music and his experiences performing it with "pros" and "ams" as part of his creed. So it's clearly the teacher in Zander that has led to the unusual presentation of this recording. But I wonder if he's in danger of making a rod for his own back. From his notes and talk he understands the work superbly well and can communicate his understanding clearly. The problem is, when we finally get to listen to the performance the notes and talk have been us leading to, will we hear one matching such a depth of understanding ? Is Zander as good a conductor as he is a teacher ? Can he also get a leading professional orchestra (as opposed to a semi-professional and student one) to live up to what his intellect and emotions tell him is there ? I will say straight away that on the evidence of this recording the answer is no, not when compared with others who have recorded this work and done it without the luxury of talks, notes, diagrams and tributes from children. Because Zander has done himself no favours choosing this, of all works, to record and present in this way. In order for a recording of Mahler's Ninth to succeed it has to face competition that could not be stiffer. Harsh, but that's the way it is when you're out buying CDs. Of course you could say this issue is ideal for the newcomer because of the "extras" and the price, and there would be something in that. However, even taking that into account, I would still say a greater performance, one that lives up to all Zander knows is there and more, will, even in the short term, serve better. In his essay he sees the first movement representing a crucial dichotomy at the heart of the symphony. He writes: "There seems to be two kinds of music....music that is gentle, harmonious, sublimely beautiful, and resolved; and music that is complex, dissonant, full of tension, and unresolved. And the structure of the movement seems to set these two kinds of music against each other." This dichotomy represents the duality in Mahler, Zander reminds us, and the time in which he lived, looking back to the romantic, unified past and forward to the dissonant, fragmented future. There is much to be gained from seeing the work in these terms and Zander manages to illustrate the two poles of the dichotomy quite well in his performance of the first movement. But there are other performances which do it better, more profoundly, and also recognise that a dichotomy is also the sum of its poles and the area between. Further, if fixated on one idea and one aspect of it, a performance is in danger of emerging as rather shallow and frankly that's how Zander's performance sounds in the first movement. This also appears to have a knock-on effect. The quieter passages between the more animated ones are interpreted by Zander as very slow and very withdrawn, to the extent they're in danger of becoming detached from the whole with little definition or focus, holding up the forward momentum and any feeling of line. The impression is of just marking time between crises. So there are "sharp oppositions" conveyed in the first movement but it's as if they are seen from a great height over large areas. But Zander is very insistent in his recorded talk on the minutest attention to detail, using the first two pages of the score and his notes over them for us to see this. Yet, to take just one example, in the crucial climactic passage between bars 314 and 322 he appears not to have noticed, or chosen to ignore, that the two statements by the massed trombones of the opening rhythmic motif of the work have different dynamic markings: fff the first time and ff the second. Hear how Boulez gets his Chicago players to deliver this. (Deutsche Gramophon 289 457 581-2). I mentioned earlier Zander making a rod for his own back in being so detailed in telling us what his aims are. A good example can be found when he writes: "....in the first movement of Mahler's Ninth....there are virtually no subservient voices. What appear to be accompaniments turn out to be independent voices with a life of their own....The orchestra is no longer used as a tutti instrument, but rather as a vast chamber group....The ideal orchestra for the work would be one composed entirely of great individualists, each with the courage to play exactly what he is given, regardless of what the others are doing." This is all valid, but though the Philharmonia play very well, they don't give the impression of achieving this effect. In fact they turn in a very corporate account indeed. In an interview Zander says of rehearsing the work with the Boston Philharmonic: "We were in there week after week and the only recorded performance I listened to was Walter's magical live Vienna Philharmonic recording from 1938." (Dutton CDEA5005). So this invites one comparison to use because there WAS an orchestra of "great individualists", including some who had played under Mahler himself. You can also make a comparison with another orchestra of "great individualists", the London Symphony of 1966 under Jascha Horenstein, (Music and Arts CD-235), and the same conclusion is unavoidable. Two of the great Mahler conductors working with two personality orchestras recorded live and conveying the very sense of the orchestra as chamber group that seems to elude Zander, as he puts it: "....encouraged not to compromise the sharp oppositions, not to minimise the strangeness, even the ugliness that Mahler has written into his score". If you want a passage to illustrate this, the closing pages of the movement, from the duet of solo horn and flute onwards, would be as good as any. Zander's insistence on veiled, withdrawn playing robs it of the chance for the players concerned to show chamber-like qualities. So, on a number of levels, there is much that is unsatisfactory in the second movement. Listen again to Walter, Horenstein and Klemperer to hear how it ought to go and to be in keeping with what Zander appears to want. Note the coarse rhythmic sense and the heavier tread, reinforced by all three in foot stamps on the podium at precisely the same moment as the dance gets underway. To conductors from their backgrounds music like this, even under metamorphosis, was "bred in the bone". I would also have expected Zander to make more of the tempo changes in the movement so crucial that Mahler refers to them as I, II and III. The changes, brilliantly realised in the Boulez recording, are somewhat half-hearted, almost designed not to sound awkward. In his talk Zander refers to how he has solved one tempo change that under other conductors sounds awkward. Give me awkwardness any time in this movement because that is what I believe Mahler wanted. The close of the movement where, as Bruno Walter has it, we know "the dance is over" is one of the most grotesque and disturbing passages in all Mahler and can be made to sound truly poisonous. Under Walter in 1938 it does: his "great individualists" see to that. Under Horenstein likewise, and note the prominence he gives to the contrabassoon. Under Zander the close of the Scherzo is merely a mild irritation. For Zander the most remarkable aspect of the Rondo Burleske is its contrapuntal mastery and he is right to draw attention to this. But when he writes "at first it may sound utterly chaotic, but gradually we realise that it is a tour de force of controlled contrapuntal writing" I start to disagree and believe he may be elevating this aspect above others with the result that too much control is exercised where more abandon is what is demanded if the world of feeling this movement represents is to be made clear. If anything any sense of chaos at the beginning should be added to until the whole movement is in danger of breaking up. But at least Zander achieves what he sets out in his essay. His need for control also seems to be behind the fact that he is marginally too slow, but that isn't the whole story. Klemperer is slower and yet conveys a world of impending chaos. Bernstein knew what this music meant: "....a farewell to the world of action, the urban, the cosmopolitan life - the cocktail party, the marketplace, the raucous careers and careenings of success, of loud, hollow laughter." I would only add it's also the music of a world about to go smash. Listen to the Walter recording with the Vienna Philharmonic of 1938 (playing when the world was on the verge of going smash for a second time) and the manic, almost unhinged frenzy with which they tear into this movement, not letting up until the end and so making the blissful interlude in the centre even more moving in its nostalgic power, is unforgettable. Or, only slightly less manic, Horenstein and the LSO where Gervase de Peyer's solo clarinet keeps squealing like Till Eulenspiegel strangling on the gallows. Such concepts seem miles away from Zander's stated aim of control which, to give him his due, he does achieve. The last movement under Zander is well-proportioned. By that I mean the overall tempo and pacing across the movement is fine and it balances the long first movement. Something that isn't always the case when the symphony's "top-heaviness" can be accentuated. (It is worth saying that, though I am rather underwhelmed by this whole performance, it's at least a consistent approach and delivers a performance that has much structural integrity.) But when Zander writes of the last movement: "....the textures are rich and full, the counterpoint astonishingly opulent" it's a pity to find the strings are rather spare in volume and I'm worried by Zander encouraging the same emphatic lunges in the strings that disfigure the first movement too and which here have the effect of dissipating any opulence rather than aiding it. Even though it does have the effect of linking the first and last movements in our minds. The Philharmonia strings cannot match the "saturation-quality" or nostalgic yearning of their counterparts in the old Vienna Philharmonic even in a 1938 recording, and seem to scramble the opening. Whether it's the gut strings, the old-world style of playing, or a trick of the balance, the sound of the old VPO riding every climax shows again what is missing in Zander's account of the same passages. Zander also writes: "....there are moments of extreme withdrawal - those bleak, passionless passages that Mahler marks to be played 'ohne Ausdruck' (without expression) and that are often scored for just a handful of instruments." Zander takes Mahler at his word and the effect, as in the first movement, is to accentuate the divide between louder, more animated passages and the passages of "extreme withdrawal" which are here again so withdrawn they're in danger of detaching themselves, becoming longueurs. This becomes a major problem in the remarkable closing pages which under Zander reminds me more of the closing movement of Vaughan Williams's Sixth Symphony where a completely different effect is aimed at. I wonder if Zander is being too literal in interpreting what Mahler is asking for. That when Mahler writes "without expression" he's writing in terms of what "expression" meant for him rather than what it means for us and an adjustment is needed, one that most conductors have managed to make as part of the continuing performing traditions of this piece. I cannot believe Mahler meant the closing pages to come over quite as cold and dead as they do here, to the extent that the thread becomes indistinct at times. There should be some degree of feeling otherwise we are not going to care about the music and its place in the whole. Zander writes of the ending: "It has none of the nihilism and cold sense of futility which is found in so much contemporary art. On the contrary, there is a deep attachment to joy. Despair and knowledge of suffering are turned into a discovering of the meaning of life." Indeed. So why play it as though the opposite were the case ? This is the part of the 1938 Walter recording that also disappoints somewhat. For some reason he keeps a sharpness of focus to the end, refusing to slow down even to the extent that he does in his later stereo recording. Maybe he felt his audience were getting restless, maybe understanding of the work wasn't so complete then. Horenstein stretches the music on the rack, so does Bernstein, so do most other conductors to a greater and lesser degree and they keep their sense of the humanity that this most human of composers invests it with. In my experience only Zander (and possibly Karajan) give us such coldness and lack of feeling. In all a disappointment, more pronounced in comparison with other recordings. The sound recording is good, though not great: close-in but, conversely, recorded at a lower level so needs to be played back higher. Zander makes great play of dividing his first and second violins to left and right as Mahler did and is to be congratulated for that, as are the engineers for letting us hear it. But Klemperer does that too. The orchestral playing is good, but there seems a too much of the routine about it, as if the players have listened to their conductor's copious instructions, nodded, and then just played the music as they normally would. Did he perhaps blind them with science in rehearsal so that they just lost patience? Should he have talked less and just let them play ? Can you rehearse a great professional orchestra in the same way you rehearse a semi-pro or student one ? A rehearsal CD would have been interesting. I don't think there is anything new for seasoned Mahlerites here. It's a performance you would be perfectly happy to hear in the concert hall but in a recording you need something that will benefit you over time and repeated hearings. For newcomers to the symphony there is the extra CD, the notes and the price. But even newcomers would benefit from something more profound: Walter (1938), Klemperer, Barbirolli and Horenstein (1966) are "hors concours", with Walter (1960), Haitink, Boulez and Rattle to name just a handful of more recent, or better recorded, versions following closely. There are others. We are spoiled for choice and new recordings have a lot to live up to.